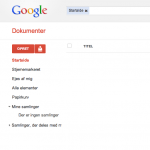 In this guide you will get an introduction to, how you can use Google Docs. 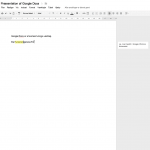 In order to use Google Docs, you need a Google account. If you do not have one already, it is easily created here. 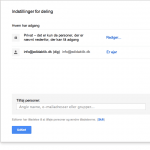 Remember to confirm your email address by, clicking the url in the email Google sends you. 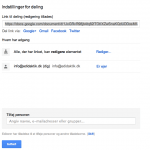 After the account is created, skal du gå ind på dette link: docs.google.com. On the frontpage you can see this menu on the left side of the screen. Den røde knap ‘Opret’ giver dig mulighed for at oprette forskellige dokumenter. You can choose between different types of documents, including spreadsheets, presentations and drawings. In this guide we concentrate primarily on ordinary text-documents. Click the ‘ Document ’. 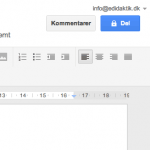 You will now see a text-editor, som minder om den du finder i Word – dog er editoren i Google Docs noget mere simpel. 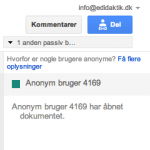 Du kan vælge forskellige teksttyper og formatere teksten ved hjælp af værktøjslinjen. Øverst i venstre side af skærmen kan du give dit dokument et navn. Dokumentet gemmer automatisk dine ændringer – derfor er der ingen ‘Gem’-knap som den du kender fra Word. 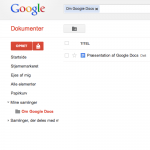 One of Google Docs biggest forces is, that several persons can write together in a document simultaneously. 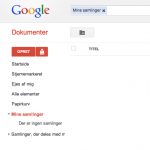 In the upper right corner of the screen you can share your document. Click on the blue ‘ Del ’-button. You will now see this box. It allows you to share the document with others. At the top you can see the status of the document. It is set by default to be private, which means that only those persons you give access can see it, and that these persons must have a Google account to read and write. 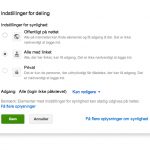 Ved at klikke på ‘Rediger’ kan du ændre disse indstillinger, for example, so that all, without being logged in, can edit your document when you have given them the url of it. 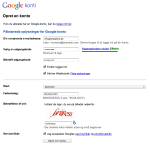 However, it is recommended, that students also create a Google account. You can also choose, that the people you share with can only read or comment the document. Du kan nu udsende linket til dine elever, e.g. via Facebook, og de kan begynde at redigere eller læse – alt efter hvilke tilladelser du har givet dem. You can also, if you know the students' Google-account-e-mails, send the document at the bottom of the page. In the upper right corner you can, when one of your students opens the document, see that there are more active users. If you have asked the students to create a Google account, you can see their names. If not, they appear as anonymous. All users have the opportunity to chat about the contents of the document at the bottom right corner. I dokumentet kan man se ændringer foretaget af dokumentets andre brugere mens de skriver dem. Each user of the document will have a color code, so that everyone can see who writes what. It is also possible to insert comments into the text. Right-click in the text and select the insert comment ‘ ’. 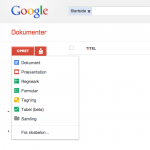 In order to be able to get an overview of your documents in Google Docs, It may be a good idea to create folders. 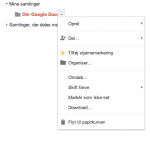 Det gør du på forsiden: docs.google.com. Klik på ‘Mine samlinger’ i venstre-menuen. By clicking the folder icon, you can create a new collection, fx for your team, your group or your subject. You can now drag your documents into the newly created collection, and subsequently choose your collection in the left menu, and see the documents located here. You can create as many collections as you want, and by clicking on the arrow immediately to the right of the collection name in the left-menu, you can share an entire collection with your students. Remember, Google Docs works best in the Google Chrome browser, which is available for both Windows, Android and Mac. 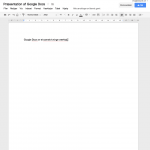 If you want to know more about the features of Google Docs, you can read this guide.